This post is sponsored by Krusteaz. As always, all opinions expressed here are my own. Thank you for supporting the brands that help make Pumpkin ‘N Spice possible! Peanut Butter and Jelly Baked Pancakes are a warm and cozy breakfast to get you going in the mornings. 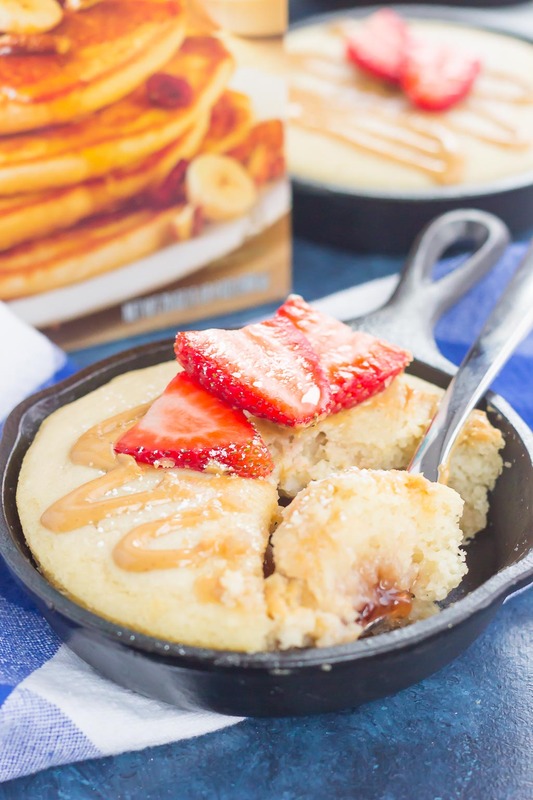 Fluffy, buttermilk pancake batter is swirled with sweet strawberry jelly and then baked in mini cast iron skillets. 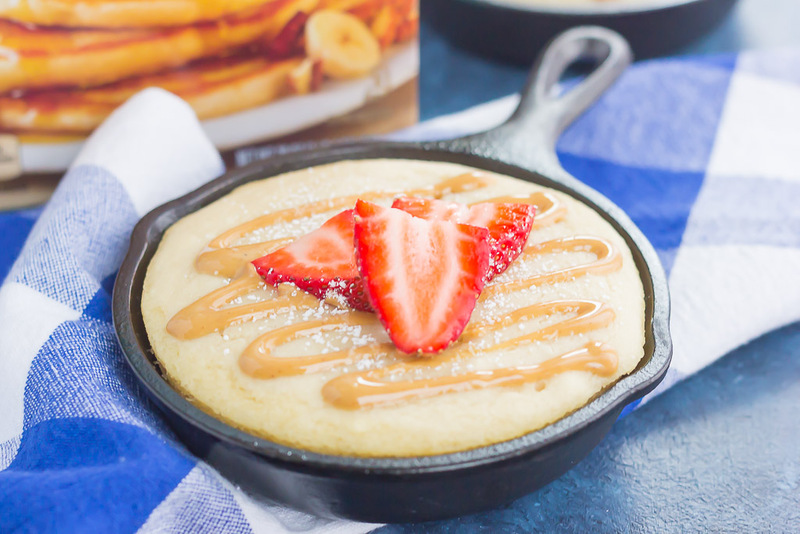 Drizzled with a sweet peanut butter syrup and topped with fresh strawberries, this easy breakfast is ready in less than 30 minutes and perfect for the whole family! Now that we’re into the first full week of January, the gloom of winter is settling in. If you’ve been hanging around here long enough, then you probably know that the cold weather, snow, and I don’t exactly mix. Yes, I live in the Midwest, but it doesn’t mean that I like the cold temps. I don’t necessarily mind it up until Christmas, but after that, I’ll take sunny skies and warmer weather every day, please. Ok, I’ll admit that the snow is pretty. Pretty when I can stay all warm and cozy in my house and not have to drive in it. And speaking of snow…it always reminds me of my childhood when we get a significant amount. You know, when schools close and kids get a snow day. That was the best feeling when I was little! If you live in a snowy climate like I do, then you probably know what I’m talking about. I remember there being some kind of phone tree when I was in grade school for when school closed. My brother and I would anxiously wait for the supposed phone call to let us know that school was cancelled, and then my parents would pass on the call to the next person on the list. Oh, the feeling of school being cancelled! It was wonderful when I was older and in high school, but it was really the best when I was younger. My brother and I would sleep in (or not…and watch early morning TV), enjoy breakfast, followed by some playing in the snow and lots of hot chocolate. Those were such great memories! Nowadays, I don’t get ‘snow’ days from my job. When I was back in the corporate world, my work (and a lot of others in the area) were cancelled due to a huge snowstorm about six years ago. Now that was amazing! But, since I now work for myself, from home, on Pumpkin ‘N Spice, I don’t really have an excuse to not work. But, for all of you moms and dads out there with little ones, or for those of you who take snow days whenever you can, isn’t it the best feeling? And you know what goes wonderfully with snow days? Breakfast! A warm and cozy breakfast to keep you fueled all morning long. There’s just so many things that I love about these Peanut Butter and Jelly Baked Pancakes. I’m a sucker for mini dishes, and these pancakes are look adorably delicious when baked in mini skillets! Of course, you can easily bake this in a regular 9 inch skillet, or even a baking dish and it’ll turn out just as good! Next comes the pancake batter itself. You must know by now that I’m a huge fan of Krusteaz. 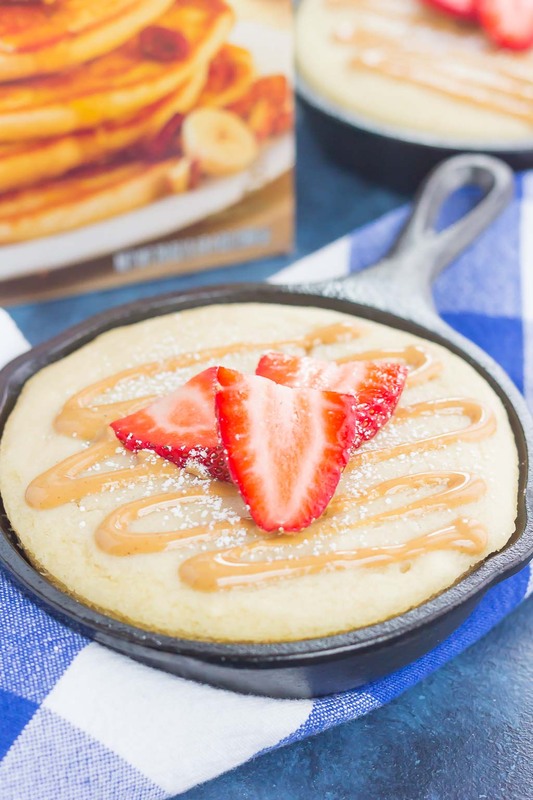 From their delicious cookie mixes, muffin mixes, quick bread mixes, and this Protein Complete Buttermilk Pancake Mix, I love it all! 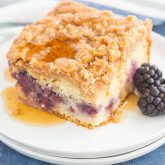 Remember this Peppermint Sugar Cookie Ice Cream Pie, those Baked Pumpkin Streusel Donuts, that Blackberry Streusel Pancake Casserole and this Blueberry Almond Poppy Seed Muffin Trifle? 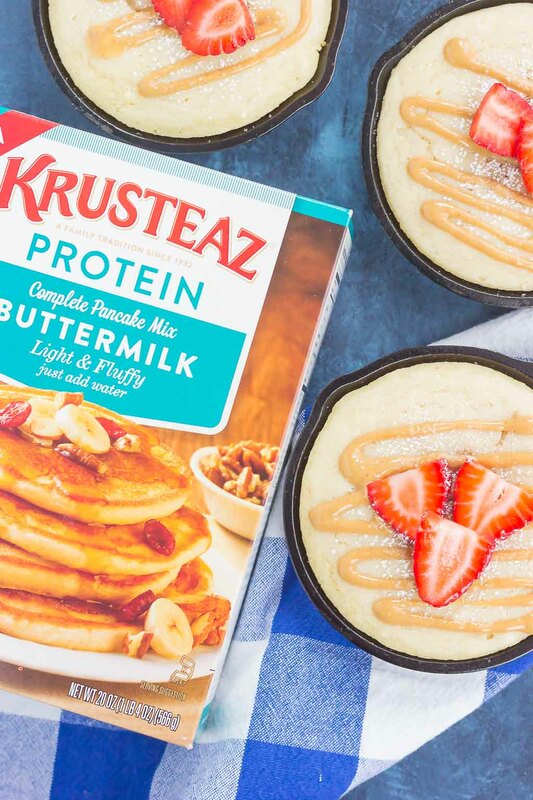 Yep, I really do love Krusteaz! What gives these baked pancakes that sweet jelly flavor is the strawberry jelly that’s swirled right into the batter before it’s baked. And when you cut into the pancake, you’ll see the jelly surprise just waiting for you! And then comes the peanut butter syrup! It’s just creamy peanut butter and a touch of maple syrup mixed together to give it the perfect amount of flavor. After all, you can’t have the jelly without the peanut butter! And last, but certainly not least, these pancakes are baked! That means no flipping is required, and no mess is involved. Simply whip up the batter, pour it into the skillet(s), and pop it into the oven. Easy peasy and oh-so delicious! Top these Peanut Butter and Jelly Baked Pancakes with some fresh strawberries and a touch of powdered sugar for the finishing touch. It’s a warm and hearty breakfast, perfect for those winter snow days or for when you want to enjoy your breakfast on lazy mornings. Click here for the full printable recipe! I totally don't mind seeing the snow outside if I don't have to go anywhere either!! And if it's going to snow, I'd rather it to reeeeeeeeally snow that just get enough to make a mess, ya know? 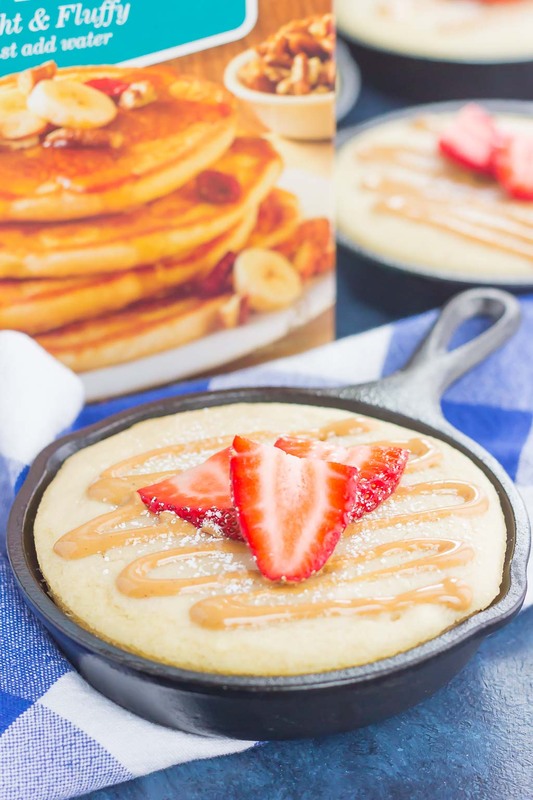 Love this classic twist on pancakes and those little skillets are adorable! What a nice treat for weekend brunch with coffee! Pinned! Happy Monday, my friend! Totally agree about the snow! Thanks for the pancake love, friend! I've never lived in a snowy climate but I've been getting away every year in the winter to enjoy some and I love it. Living in it would be a challenge however, but at least it feels like a real winter! 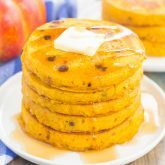 These pancakes are the prettiest things Gayle and are such a fun breakfast! 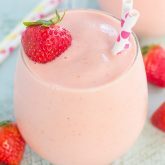 My boys would adore these and I love the added protein boost. I can't wait to try this! Thank you, Marcie! I love the added protein boost too and the fact that these are baked! Hopping over to check out the recipe! 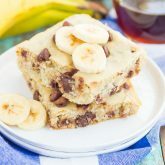 This looks like the perfect breakfast -- especially with the added protein in that mix! YUM. Thanks, Blair! It's one of my favorite recipes! that's such a perfect breakfast to wake up to! yum! These. Are. Life. PB&J all day everyday- but in the form of pancakes? YAAAAS. Need to try! Thanks, Karly! It's SO good in pancake form! This will be perfect for a snow day and any day breakfast! Love these! Pinning :) I remember that storm, has it been 6 years since then already? Thank you, friend! Hopefully we won't have any other snow storms like that this year!